Knight Sound and Lighting can service, upgrade, and retrofit your existing lighting system with the Leprecon LDS dimmer. Contact us at 866-457-5937 for 24/7 free technical support! The LDS-610 from Leprecon is the latest in architectural dimming suited for both retrofits and new installations. This space saving style of distributed dimming offers a variety of mounting options and can be easily daisy chained to make larger systems. 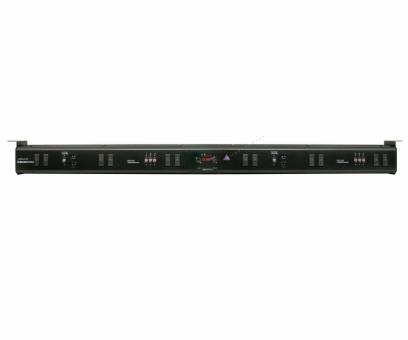 The convection cooled 6-channel dimmer is equipped with 10A circuits and can operate in either a single or three-phase configuration. The terminal strip is conveniently located under the hinged front panel allowing for ease of wiring and access to electronics. Through the display based menu system, each channel can be defined as a non-dim, fluorescent or fixed intensity level. Output options include duplex, stage pin and twist-lock connectors. Optional two non-dim breakered auxiliary duplex connectors are available. The LDS series dimmers are available with built-in W-DMX for wireless DMX control. Please call for details. Available in black or white. ETL listed.